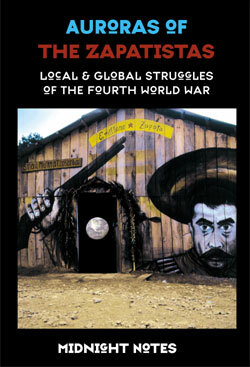 Auroras of the Zapatistas: Local and Global Struggles in the Fourth World War by Midnight Notes Collective (2001) - Midnight Notes 13 (2001) – (can order directly from Autonomedia - $14.00 plus postage). (order directly from Autonomedia! [$12.00 plus postage]). Midnight Notes 12 (1998) - One No, Many Yeses. 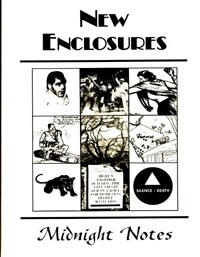 Midnight Notes 10 (1990) - The New Enclosures. Midnight Notes 9 (1988) - Wages - Mexico - Libya - Wages - Mexico - Libya – India. This was election year and the U.S. Left was registering voters for Mondale. For MN this was "the year of the Lemming" when "the left and much of the U.S. working class is leaping off a political cliff, driven by a mythical scarcity which exists only in political imagination or will. "How is it possible?" explains the Left's political suicide. "Bolo'Bolo" is an answer to this leftist Lemming leap into the maw of the Planetary Work Machine. It precisely describes the substruction of the three deals of the present world to create together a second reality: Bolo'Bolo. 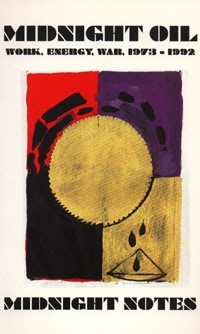 Midnight Notes 6 (1983) - Postumous Notes. This 'Midnight Querist' began this issue with questions of the movement's dead. The issue then analyzes the "Peace Movement" and its control by the "re-industrialization" sector of capital. It also presents a proletarian nuclear strategy that is increasingly relevant for us in the 1990s. We catch the post humorous laughter of hte insurrectionary dead from the eighteenth century, then address our real dead, from the voice of Rigoberta Menchu speaking from Guatemala, and our Italian comrades railroaded, tortured and killed. It concludes with an "Audit" of the balance of living class forces in the early 80s. Midnight Notes 5 (1982) - Computer State Notes. Midnight Notes 4 ( 1981) - Space Notes. Midnight Notes II. Vol. 1 (1980) - The Work/Energy Crisis and the Apocalypse. Midnight Notes Vol. 1 #2 – No Future Notes: the Work/Energy Crisis & The Anti-Nuclear Movement. Midnight Notes Vol. 1. #1 (1979) – Strange Victories.